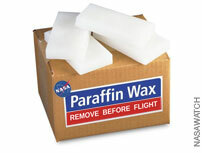 SLS Plumbing Is Full Of Paraffin Wax. Oops. By Keith Cowing on May 18, 2018 2:28 PM. "At a May 17 meeting of the Aerospace Safety Advisory Panel (ASAP) at NASA's Kennedy Space Center, panel member Don McErlean said the committee had been briefed on a "late development" with the core stage, being constructed at the Michoud Assembly Facility in New Orleans. A "routine quality assurance inspection" of the core stage, he said, discovered contamination in tubing in the engine section of the core stage, which hosts the vehicle's four RS-25 main engines and associated systems. That contamination turned out to be paraffin wax, which is used to keep the tubes from crimping while being manufactured but is supposed to be cleaned out before shipment." This page contains a single entry by Keith Cowing published on May 18, 2018 2:28 PM. School Shooting Near NASA JSC was the previous entry in this blog. NASA Starts The Week With A Commercial Launch From Virginia is the next entry in this blog.